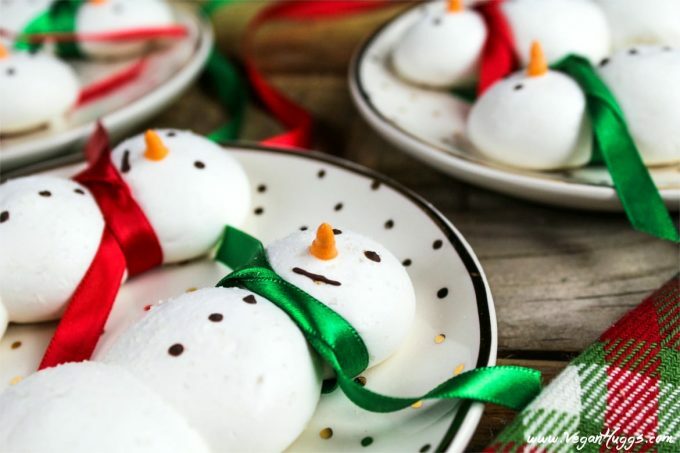 These snowman-shaped Vegan Meringue Cookies will be a hit at your next wintertime gathering. They are sweet, crisp, airy and completely adorable! It’s time to start off the Christmas craziness with these festive Vegan Meringue Cookies. 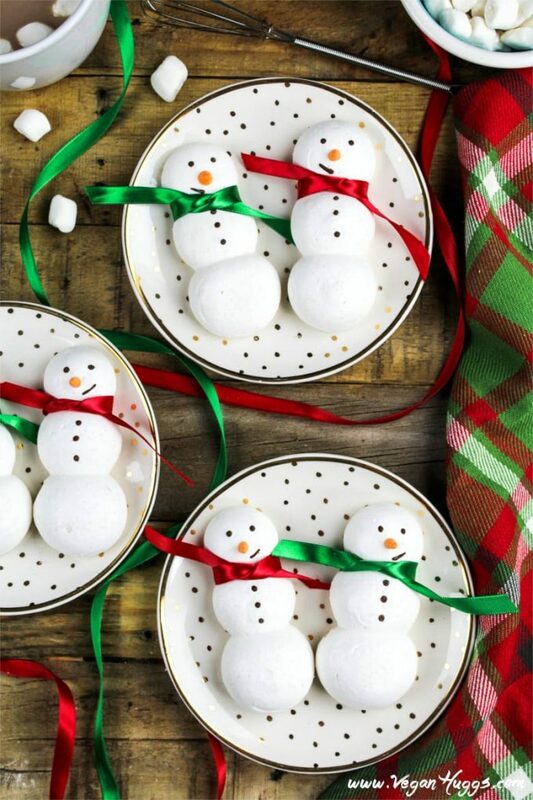 Yep, they are shaped into snowmen with cute little carrot noses. Who can resist? 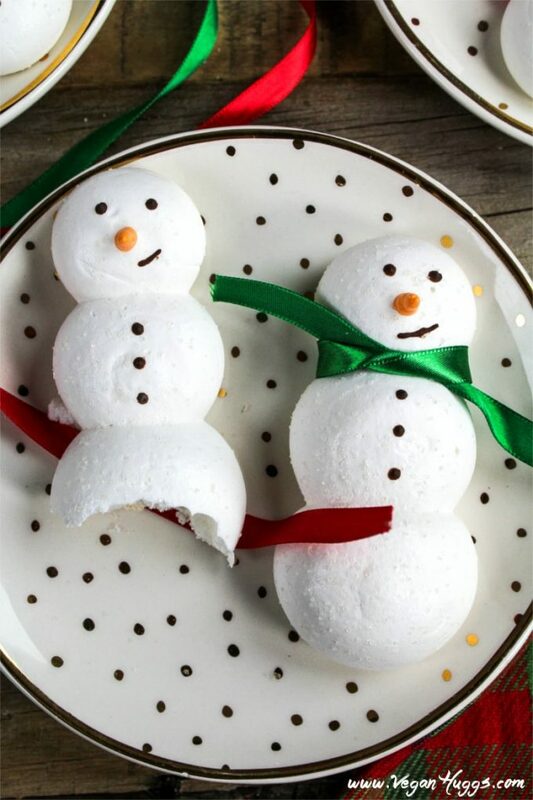 I first saw these Snowmen on Taste of Home and I just had to veganize them! These little snowy guys are pillowy, soft, crispy and sweet all in one cookie. There’s just something dreamy about biting into a puffy cloud of sugary goodness, and this time of year is the perfect time to do it. If you leave these cookies out for Santa with this Chocolate Hazelnut Milk, you might get an extra present or two. If you celebrate Hanukkah, just swap out the red & green ribbon for blue, white or silver. 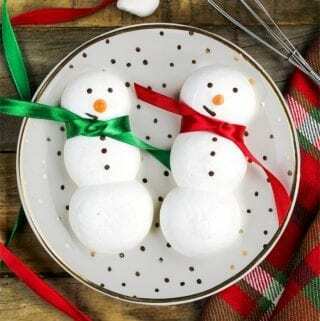 Snowmen cookies can brighten up any holiday with their chocolate smiles and frosty face. Well, there’s a new sheriff in town and it’s chickpea water. Yep, you’ve read that right…it’s bean water! 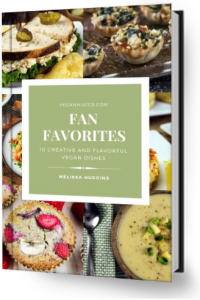 In the vegan world, we know it as aquafaba. It sounds fancy and all, but it’s just that water we’ve dumped down the drain for years! If we only knew! This magical bean water works exactly like egg whites do when whipped up. It gets fluffy, white, pillowy and glossy. It’s seriously what dreams are made up of! You won’t taste bean flavor either because the sugar will take care of that and make everything beautifully sweet. Believe it or not, this vegan fluff will cook up the same, too. Your Vegan Meringue Cookies will be crispy on the outside and slightly chewy on the inside. You’ll be biting into a cloud of heaven! Along with the aquafaba, you’ll need vanilla extract, sugar & cream of tartar. Now the cream of tartar isn’t 100% necessary, it just helps the meringue hold its shape better. You can find it in the spice aisle at your local grocer. One essential item you’ll need is a stand mixer or a hand-held electric mixer. That bean water doesn’t stand a chance with the whipping power of one of these. I wouldn’t attempt it by hand, because you might not be able to move your arm afterward, and that might hurt your cookie eating skills. You’ll also need 2 decorating bags (or regular Ziploc bags) to pipe the snowmen bodies. Cut a little hole in the bottom and fit them with a Wilton #3 and #12 (or something similar). For the little carrot noses, you’ll need 1-2 drops of food coloring. Just reserve 1/3 cup of the meringue and mix in the color. Don’t overdo it because the meringue could become runny. To create the eyes, mouth, and buttons, I melted vegan chocolate chips and painted them on with a fine-tipped paintbrush. I’m sure a toothpick can be used too. You can totally get creative with the snowmen scarves. I used ribbon, but vegan rope candy or sour candy strips can be used, too. 1- Dip the back in chocolate and sprinkle crushed candy cane on top. 2- Sprinkle a bit of granulated sugar on the wet meringues to give a sparkly effect (you can buy sparkly sugar too). 3- Make these into cookie pops. Just pipe the meringue on a lollipop stick and bake the same way. When cooled, dip the back in chocolate and add crushed candy cane, if preferred. *Step by step photos starting left to right. 2 decorating bags or ziploc bags. 1 fine tipped paint brush for chocolate eyes , mouth & buttons. Cut tip off decorating bag (or ziploc) & fit with decorating tip (for both bags). Using a spoon, transfer the white meringue to a pastry bag fitted with the #12 tip (you might need to fill twice). Leave about 1/3 cup meringue for orange noses. Gently twist the top to close & keep shut with a clip, band or use hand to keep closed while piping. 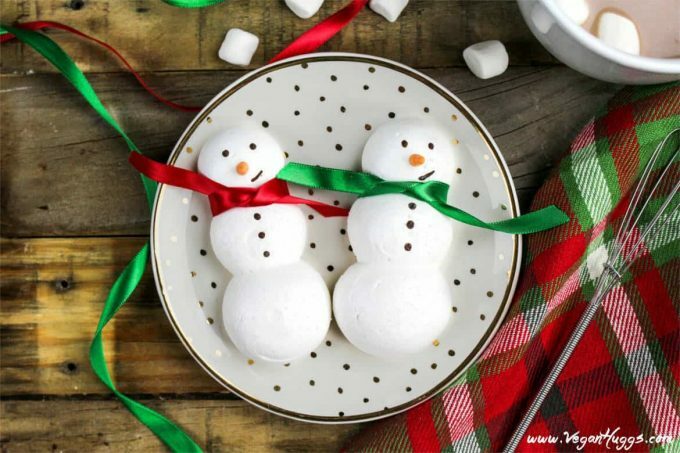 Start piping the snowman head on parchment-lined baking sheet. Squeeze from the top and create a quarter-size head shape. Don't touch tip to paper, hover it over it a little bit about 1/4 inch. Stop squeezing before lifting up to avoid a long peak from forming. Continue to the mid-body, making the circle a bit larger than the head, and so on for the bottom half of the body. The three circles should be connected. Continue until white meringue is used up. Leave about 2 inches in between each cookie. If little peaks form, slightly dampen your finger & lightly press them down. The cookies will smooth out more as they cook. Put 1-2 drops of food coloring into the remaining white meringue and combine. Be careful not to use too much or it could make the meringue runny. Fill your pastry bag and begin piping the noses. I made a tiny circular motion as I worked up. Place in oven for 1 1/2 - 2 hours (*see note). The cookies should be light and crisp and not browned. To check for doneness, test to see if a cookie will easily lift off parchment paper. The bottoms should be dry and not sticky. Turn off heat & let cookies completely cool in oven before removing to avoid cracking. When cookies are completely cooled, melt your chocolate chips over low heat & stir constantly to prevent burning or microwave for 30-60 seconds. Using a small-tipped paintbrush or toothpick, dot on eyes, buttons and make little smiles. Have fun with it! 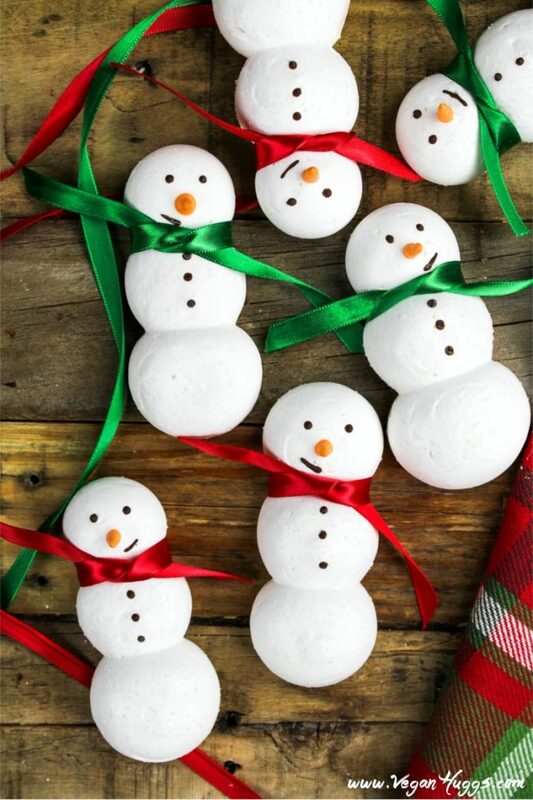 For the snowmen scarves, cut & tie ribbon around the neck or use vegan rope candy. 1. Make sure the mixing bowl & attachments are very clean with no oil residue. Clean with vinegar, if needed. 2. To check for stiff peaks, remove whisk & dip into meringue and hold whisk straight up. If the peaks fall over, continue to whip until they are firm and don't fall over. 3. Cream of tartar isn't completely necessary to use, but it does help the meringue hold its shape a little better & longer. 4. I use a balloon whip attachment, but a whisk attachment can be used too. * I lightly sprinkled granulated sugar on top of the wet meringues to give a subtle sparkly effect. *Oven Temperature: My oven tends to run hot, so I heat it to 200 F and leave the door open slightly while cooking. My meringues take 1 1/2 hours to finish. I turn the heat off after that and let them cool for a few hours in the oven. A hot oven can cause the meringues to cook too quickly on the outside. Also, cooling too quickly can cause cracking. Don't open the door all the way too many times, just keep a careful eye on the cookies so they don't burn. 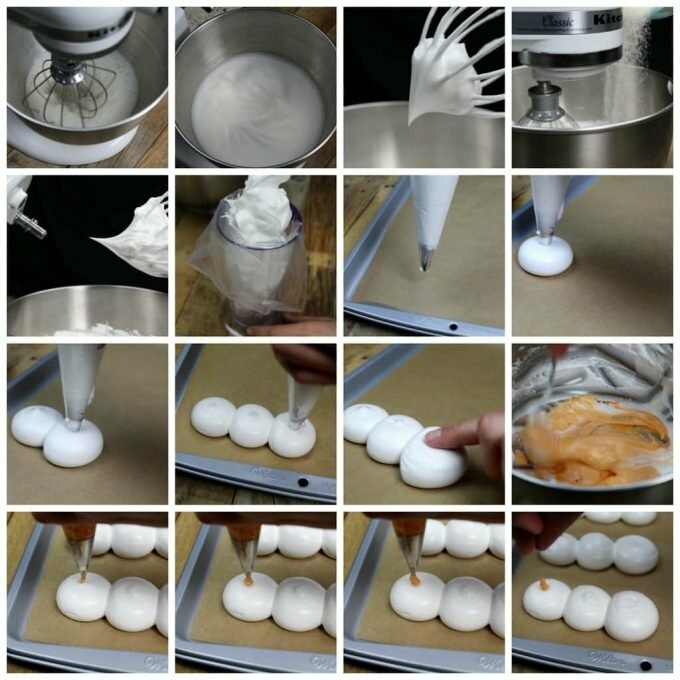 *If the meringues get lightly brown on the bottom, it shouldn't affect the way they taste. If you want to cover it, dip the backs in melted chocolate and place on wax paper to dry. Volia! Nobody will ever know. **Step by step photos in the post above. Looking for a recipe for your holiday morning? You might be interested in these Apple Cinnamon Baked Oatmeal Muffins. They are easy, delicious and will feed a whole herd of house guests. Can I freeze them? They are simply adorable! Hi, how could you store these? I’m wanting to have a baking day 10 days prior to Christmas- will they last 10 days? Hi there, I don’t think they would be very fresh after 10 days. I store them in an airtight container for 4-5 days. Thank you for stopping by. Amazing!! Who discovered this about aquafaba? Ive tried whipping flax water to no avail…this is miraculous! I know! It’s a dream come true! There’s a whole FB group dedicated to it called Aquafaba (Vegan Meringue – Hits and Misses!). You should join. So much information on its uses and success stories. Have a great weekend and thanks for stopping by! Thank you for sharing! They look wonderful! So happy there are vegan alternatives. If I cooked my own chickpeas how much brine would I need for the recipe? Hi Maria, Yes, it really is nice to have so many vegan options out there. I wish I knew more about the homemade brine. I’ve only used the canned brine. There is a FB group that can help answer this question though. The link is in my post above. I’d love to hear how they turn out for you. Have a wonderful holiday & happiest New Year! Thank you!! To you as well!!! A few years late but Just in case someone else is wondering, my can gave me 1 cup of aquafaba. We’re bracing for “snowmageddon” tomorrow—might need to make these for the boys. They are SO cute! These are allllmooost too adorable to eat! But I think I could make it happen. These are so cute!!! I love their little smirks! These are seriously the cutest things I’ve ever seen. They are perfect! Bakery worthy! I’m certain if I try this they won’t come out looking nearly as adorable, but dang it, I’m going to try!! Love it! These are probably the cutest things I’ve seen for Christmas so far this year! I these would be a hit at school for kids too. I love what we can do with aquafaba now! Thank you, Mary Ellen! My son brought a batch to school already and the kiddos were all smiles. Aquafaba is amazing! I can;t get over how adorable these are, Melissa! You’re really outdone yourself!